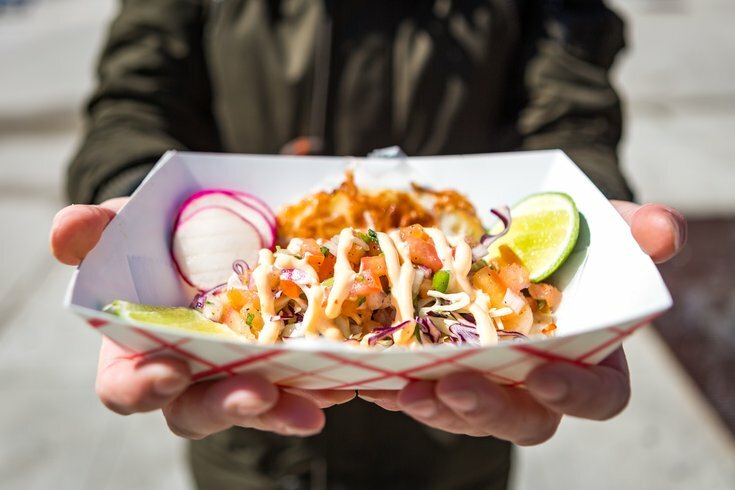 An open-faced shrimp taco from the Dos Hermanos Tacos food truck. Definitely go hungry to the StrEAT Food Festival in Manayunk on Sunday, April 14. There will be tacos, cheese curds, ice cream, barbecue, crepes and so many other delicious things to eat. More than 50 food trucks and vendors will be parked along Main Street, including favorites like Dos Hermanos Tacos, The Chilly Banana, Authentik Byrek, Undrgrnd Donuts, Sum Pig and Foolish Waffles. In addition, there will be live music on the Green Lane and Shurs Lane stages, drink specials at restaurants and bars, and sidewalk sales. The festival will take place 11 a.m. to 5 p.m., rain or shine. Then the next day, April 15, Manayunk Restaurant Week will begin. Through April 26, local restaurants will offer multicourse meals for $15, $25 or $35.